The road north-east from Bodh Gaya to Patna passes through particularly beautiful country. There are lines of palm trees around the edges of the rice fields, ponds with pink water lilies growing in them and parts of the road are shaded by majestic mango trees. You drive passed creaking bullock carts, shabby villages and peasants toiling in their fields, scenes which have probably changed very little since the time of the Buddha. After about an hour and a half on the road a long wall of mountains looms up on the horizon in front of you. These mountains are often shrouded in haze but if the air is clear they appear rugged, steep and barren. Eventually you drive through a narrow pass and find yourself in the small town of Ragjir, one of the most ancient towns in India and a favorite resort of the Buddha. In 1984 I spent a leisurely month in Rajgir, meditating and getting to know all the crags, grottos, ruins and springs around the town. One place that was on my list of 'must sees' was a stone referred to in several many ancient accounts of Rajgir. The Chinese pilgrim Fa Hien mentions seeing this stone at the beginning of the 4th century. He wrote "Leaving the old city and going north-east three li we arrive at the cave of Devadatta, fifty paces from with which is a large square black stone. In the past there was a monk who walked back and forwards on this stone meditating on the impermanence, suffering and vanity of the body. Realizing the truth and loathing himself he drew a knife to kill himself. But then he remembered that the Lord of the World had forbidden suicide. He thought further, 'Although this is so yet I am anxious to destroy greed, hatred and delusion.' So he took the knife and cut his throat. With the first gash he became a sotapana, as the knife moved further he became an anagami and as he finished he became an arahat." The stone which was splashed by the monk's blood and which Fa Hien saw was still being visited by pilgrims 200 years later when another Chinese pilgrim, the famous Hiuen Tsiang, saw it and wrote; "To the left of the northern gate of Giribajja (one of the ancient names of Rajgir) about two or three li to the east, on the north side of the southern cliff crag, we come to a cave in which Devadatta attained concentration. Not far to the east of this cave is a flat stone with spots like blood on it. By the side of this stone a stupa has been built. This is where a monk practicing meditation killed himself and attained arahatship. Formerly this monk diligently exerted himself and practiced meditation in seclusion. Months and years passed but still he did not attain the holy goal. Retiring to this spot and upbraiding himself he sighed, 'I despair at ever attaining arahatship. What is the use of this body, this source of impediment?' Having said this he sat on this stone and cut his throat. Immediately he attained the fruit of arahatship and ascended into the air and his body was consumed by fire." I recalled reading an early 20th century archeological account of Rajgir mentioning the stone and saying that it was still to be seen in a small Muslim shrine. 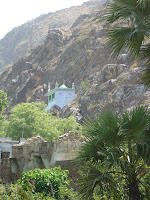 The most well-known such place in Rajgir is the Sufi shrine of Makhdum Kund. I had gone there, had a good look around but finding nothing assumed that wherever the stone might have been it had long since disappeared.Recently I was in Rajgir again and happened to go with a companion to Makhdum Kund to have a bath in the hot spring. The place had changed much since I had last seen it. All the buildings have been painted garish colors, the once moss-covered stones in the bathing pool were now covered with cheap bathroom tiles and there were touts and noisy crowds everywhere. As in many other places, these changes are due to India's middle class now having both the time and the money to play at being tourists. Locations that were once fairly quiet are now full of screaming children, blaring radios and camera-carrying extended families. After we had finished our bath the presiding mulla approached us and began trying to wheedle some baksheesh out of us. Deciding that he was going to have to earn his money I asked him about the history of the shrine. I was only half listening to his patter until I heard the phrase words "stone with blood" and I pricked up my ears. Apparently Muslim legend says that Makhdum Jahaiyan, the saint to who the shrine is dedicated, was once attacked by a lion while praying and that his blood can still be seen on a stone. "Is the stone still here?" I asked excitedly. Nodding his head the mulla pointed to the small shrine perched on the side of the cliff towering above us. We followed him up the stairs and sure enough, there on the floor of the shrine was a much-worn stone with distinct dark red spots on it. I was elated to have finally have found the famous stone so serendipitously and I ran my hands over it. Then I explained to my companion the Buddhist legends surrounding it. The mulla asked my companion what I had said and as he translated my words I could see the smile evaporate from the mulla's face. He must have been thinking of the recent dispute between Hindus and Muslims over ownership of the Babari Mosque at Ayuthaya. Perhaps he thought we were the vanguard of a horde of fanatical Buddhist soon to descend upon his shrine and lay claim to his stone. "No!" he said in a most loud and emphatic way. "That's not this stone. The one you are talking about must be somewhere else." Seeing that I had unnecessarily alarmed the mulla I agreed wholeheartedly with him and he calmed down bit. I looked at the stone very carefully. It is now broken into several pieces but the dark red spots are still visible. Remembering that both the Chinese pilgrims mention a cave used by Devadatta being near the stone I asked the mulla if there was a cave in the area. Again he nodded and led us back down the stairs to the main mosque which, it turned out, is actuall y built around the cave. By now the mulla was getting bored with my endless questions and he ambled off to try to find easier prey somewhere else. We crawled into the cave, which is very low, although parts of it could easily have been used for meditation. It was somewhat eerie to think that the disruptive and ambitious Devadatta may have actually once sat where we did now. The cave has two entrances, one of which is so narrow that it is difficult to squeeze through. Muslims believe that to crawl through the cave imparts good luck. We had a good look around the rest of the shrine to see if there were any Buddhist antiquities or anything else of interest but we found nothing. As we neared the main entrance I saw the mulla again, I thanked him for his help and gave him a generous donation which he graciously received. Unfortunately, it is not easy to identify any of the stories from the Pali Tipitaka with Makhdum Kund's blood-splashed stone. There are two stories about monks committing suicide in circumstances similar to those mentioned by Fa Hien and Huien Tsiang but there is no mention of where these incidents took place. Fa Hien's account mentions the frustrated monk walking up and down on a stone which reminds one of the famous story of Sona, the monk whose overly energetic walking meditation caused his feet to bleed and stain the ground with blood. This incident is said to have taken place in Rajgir but at Gijjakuta, which is about three kilometers from Makhdum Kund. Any of these stories could have been the basis of the legends heard by the Chinese pilgrims. It is quite easy to find Makhdum Kund and well worth a visit if you happen to be in Rajgir. From the main bus stand proceed north, at the fork in the road take the right branch and a short distance later take the road to the right. You will see the shrine at the foot of the cliff and shaded by trees. The stalls near the entrance of the shrine sell rather tasty biscuits shaped like a star and crescent. Although a Muslim holy place non-Muslims are allowed to enter Makhdum Kund. However, if the guardians of the shrine come to know that Buddhists have an interest in the stone this might change. So during your visit be discreet with both your opinions and your devotions.